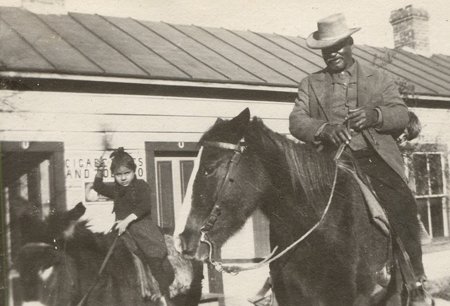 William “Curly” Neal helped turn a frontier western mining camp in the Santa Catalina Mountains of Arizona into a booming town that attracted businessmen and financiers, elite vacationers, and royals from around the world. His various business ventures as a teamster, passenger and freight hauler, rancher, hotelier, and entrepreneur point toward the pioneering spirit that helped him settle Oracle, Arizona Territory and become one of the areas wealthiest citizens. Neal was born in 1849 in Tahlequah in the Cherokee Nation. His father was of African American descent and his mother, a Native American, had walked the Trail of Tears. Not much is known about his childhood other than he ran away from home at age seven following the death of his parents. For a time Curly—so-called because of his long black curls—lived in and around railway stations doing odd jobs to support himself. At age nineteen he had the good fortune of meeting Colonel W. F. Cody and found steady employment as a military scout during the Indian Wars in Colorado, Wyoming, New Mexico, and Arizona. He survived numerous skirmishes so proven by multiple arrow and bullet wounds. Wild Buffalo Bill Cody, three years his senior, remained a lifelong friend. Curly Neal came to the Tucson area in 1878. He left the army to become a cook. He also started a business digging cellars, opened a livery in Tucson, and ran a stage coach line to the northern Arizona Territory mining towns around Mammoth. In 1885 he won a contract with the U.S. Postal Service hauling mail and did so for forty-two years out of Tucson to the northern Catalina towns of Oracle, American Flag, Southern Belle, Willow Springs, and Mammoth. Neal also secured contracts to haul ore, fuel wood, and water from the mines to the mills. William Neal, one of the friends of Wiley and Hannah Box of Tucson, soon became romantically involved with their daughter, Anna Magdalena Box. Annie was of African and Native American descent and twenty-one years younger than Curly. They married on January 4, 1892 and lived in Oracle, Arizona, forty miles northeast of Tucson in the foothills of the Santa Catalina Mountains, on their 3N Ranch. Neal delivered gold bullion from mines in the Mammoth area into Tucson without armed escorts. His wife Annie often “rode shotgun” with him and was an excellent sharpshooter. In 1895 Curly financed the building of the luxurious Mountain View Hotel in Oracle on their 160-acre ranch, which boasted a cool summer climate, pure country air, and spectacular mountain views. It became an internationally renowned resort/ health sanitarium for suffers of tuberculosis. Health and pleasure seekers came from around the world to enjoy the “epitome of western opulence.” The grand year-round hotel/ health resort doubled as a dude ranch and was in operation for 59 years. Tricia Martineau Wagner, African American Women of the Old West (Guilford, CT: TwoDot, an imprint of The Globe Pequot Press, 2007); Barbara Marriott, Annie’s Guests – Tales from a Frontier Hotel. (Tucson, Arizona: Catymatt Productions, 2002). Donald N. Bentz, “The Oracle Historian.” (Oracle, Arizona: Oracle Historical Society, Summer, 1982 V5, Winter, 1984-85 V7, Summer 1983 V6, Spring, 1988 V7). 1982 V5, Winter, 1984-85 V7, Summer 1983 V6, Spring, 1988 V7).